With Deondre Francois as the starter last year, the offense struggled immensely. It wasn’t all his fault however, as the ‘Noles did possess arguably one of the worst offensive lines in college football. Francois struggled with decision making and lacked to produce any threat in the run game. James Blackman looks to build off of his lone start in the 2018 season in which he threw for four touchdowns and 421 yards. Blackman possesses the ability to throw a gorgeous deep ball and with a threat like Tamorrion Terry, I see that becoming a staple in Briles’ rendition of the Florida State offense. Blackman’s tremendous leadership ability is one of the most exciting aspects as he becomes the starter once again. His infectious personality and never-say-die attitude are exactly what this team needs after the lack of leadership in 2018. Tamorrion Terry produced some incredible moments during the 2018 season which led us to wonder why he was redshirted in by the previous staff. DJ Matthews, Keyshawn Helton, Tre’Shaun Harrison, and Keith Gavin had promising moments as well but were not as proficient as they needed to be. This is really Gavin’s last chance to produce on the field during his career in Tallahassee. Dugans is now the third position coach Gavin has received guidance from. The former four-star recruit has all the physical tools to be a dominant wideout, we will see how Dugans is able to lead him to improve and become a consistent threat on offense. One of the most disappointing aspects of last season was the lack of improvement on offense. The offensive unit was still making the same mistakes against Florida as they made against Virginia Tech. Misalignments, confusion, and lack of speed were just a couple of the mistakes that plagued the offensive unit. It has already been noted that Taggart has noticed an improvement involving the overall speed of the offense under Briles. Blackman leading the offense will also aid to the improvement of overall fluidity of the unit. 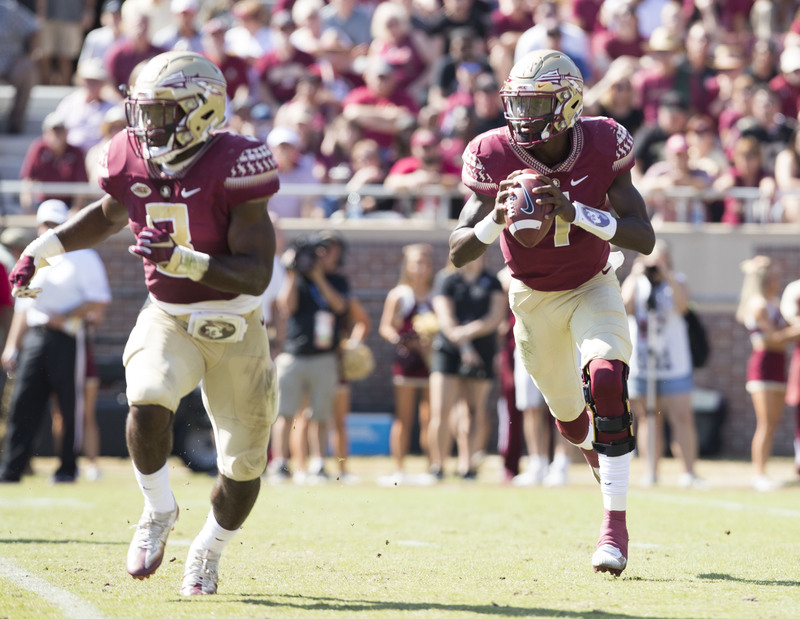 The spring game will not give us an exact picture of how the offense will look in the fall, but it will give us a good indication on how far off the ‘Noles are from how they want to look once the season comes around. With elite backs such as Cam Akers and Khalan Laborn, the talent is there to improve off a dismal year on the ground in 2018. Losing Jacques Patrick is a big blow, but Laborn is more than capable to assist Akers in the run game if he can return to 100% before the Boise State game. Laborn displayed his elite athleticism in his one reception against Virginia Tech. Unfortunately, his season was cut short due to dislocating his kneecap against Samford. Anthony Grant has also been turning heads during Spring and he will likely see the field due to Amir Rasul transferring. Randy Clements has quite the task, to drastically improve one of the worst offensive lines in college football. It has been quite evident that the offensive line group has plagued the ‘Noles for years. The group will receive many welcome additions in the Summer with Maurice Smith, Darius Washington, Ira Henry, and transfer Ryan Roberts. In the spring game, however, we will see how the likes of Jalen Goss, Christian Armstrong, Chaz Neal, Christian Meadows, and Dontae Lucas are developing. It is crucial to develop some quality depth at the position due to how injuries derailed the offensive line in 2018. I am especially intrigued to see Lucas perform. The early enrollee has the size and the ability to contribute as soon as this year and he very well could be a crucial part of the position group for years to come. The offensive line is the most important position group to see progression out of this Spring. The running game, offensive fluidity, receiver improvement, and the development of Blackman all depend on the offensive line improving drastically. If they can show signs of improvement under new offensive line coach Randy Clements, look for the rest of the offense to show signs of improvement as well.